There are about 320,000,000 people living in the United States. According to the Bureau of Labor Statistics, about 3,000,000 people are working for minimum. That is one percent (1%) of the population. So is the minimum wage uproar really about giving one percent of Americans a pay raise, or is something else afoot here? The fact is that unions and their members benefit directly from minimum wage increases even though not a single union member works for minimum wage. This is why organized labor is coming out in strong support of Obama’s proposed minimum wage increase. If he or she can still find a job, the average private-sector union member earns $22 per hour … well above minimum wage. 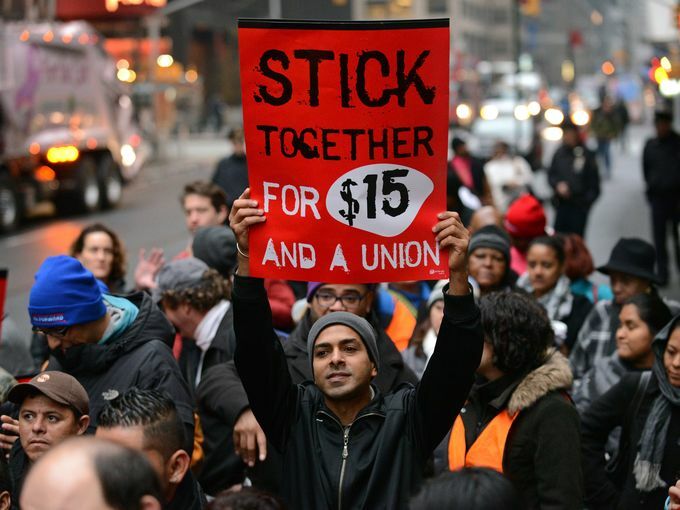 Minimum-wage hikes are beneficial to unions in other ways. Minimum wage increases restrict the ability of businesses to hire low-skill workers who would gladly work for lower wages in order to gain job experience. Union members thus face less competition from workers who might threaten union jobs. This view is not just mere speculation. In 2004, a study published in the Journal of Human Resources by economists William Wascher, Mark Schweitzer and David Neumark concluded that lower-wage union workers typically see a boost in employment and earned income following a mandated wage hike. You just have to ignore the corresponding drop in jobs and earned income for non-union minimum-wage workers. They may have been priced out of the jobs they need, but that is not the union’s concern … its members have landed higher wages and reduced competition for jobs. The dirty little secret is that union members would see their paychecks grow as the result of a Democrat-backed mandate; even though the overwhelming majority of scholarly evidence says that these wage increases have a negative effect on employment. Perhaps the American people should be more concerned with teaching the one percent of Americans earning minimum wage how to fish; rather than on giving them a fish. That might even allow some of those 3,000,000,000 to somehow find their way off the Democrat’s progressive plantation and into a life of real opportunity and freedom.